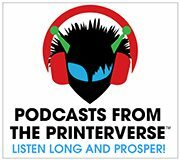 The January post in Printerverse-land is usually a “looking toward the future” or a “predictions” type of post. This year, I am going to stay with the general idea of that theme, but switch it up a little bit. Depending on your age (or state of mind) I want you to pretend that I am talking to you as your second mom, or your slightly younger cool aunt, or your wise neighbor that you go to when you need advice. However you decide to approach it, I care about you, your sales career and your company. I genuinely mean it. In a non-religious way, this is my prayer for you. Full disclosure: I did not come close to finishing the book, because it was a 7-day loaner and I was trying to read the other 2 books for my book clubs, so…. As I do with much of the non-fiction self-help-y type books that I read, I extracted the salient points with all the intention of going back and reading it again when it makes its way to the 21-day loan area. So here are the three main points about resilience that Sandberg outlines. I want you to think about these three concepts as it pertains to your sales performance going forward. Personalization – I’m sure many people have told you that it is important not to take anything personally when it comes to sales. You face a lot of rejection. You hear the word “NO” a lot. You are ignored. You are sometimes even lied to, or betrayed. How the HELL do you not take that personally? Well, the simple answer is you just don’t. Accept that all this rejection is literally part of the job description. In fact, you would not be able to do your job without it. No one in sales lives in a world where everyone says yes. Our job is to wade through all the perceived opportunity to discover the gems of those that are ready to hear our stories and explore the idea of working together. That might sound a little mystical to you. But just think of how you feel with every new customer that joins you. You feel a bit like a conqueror who has accomplished a magnificent feat, don’t you? Don’t you? Pervasive – When we are feeling down, and we haven’t closed a deal in months, and the owner or sales manager is screaming at you wanting to know where the work is, it can feel like nothing else matters but getting the sales. But the truth is, your job is just one (very important aspect of your whole life. You have hobbies, friends, family, and other pursuits that make you a complex and interesting person. Don’t let a rough patch in your career define you. Permanent – When you were the number one performer or the star of your company you wanted that feeling to last forever, but alas, it never does, does it? Well, the same is true for the bad stuff. I sincerely hope for you that 2018 is a fantastic year for you, full of new opportunity and success and the fulfillment of all your intentions and your goals. As always, I am here to help in any way that I can. Go get ‘em, Tigger! Show us your BOUNCE!